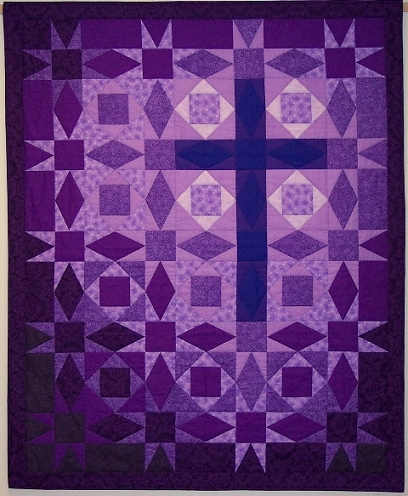 I am looking for a pattern that has a cross in the middle of the quilt. I've seen pictures of them but no patterns. Yes, I've seen a lot of pics of cross quilts but no patterns. Just wanted to say that the following one is my favorite. It's Eugene's version of Storm at Sea from Quilter's Cache. The Storm at Sea pattern is given at Quilter's Cache. Perhaps you can figure out how to insert the cross into the pattern. what a gorgeous quilt that is! Check the Cross and Crown pattern at quilterscache.com. We amde one for our Associate Pastor and he loves it. Charismah did a tute for one on her blog. Thanks for the link. It's the first time that I've seen this tute. I must have missed it when it was first posted. Thank you for all the options. Now just to decide which one to use. Shabbyfabrics.com has a very nice pattern that you might like. Does anyone know how to find this pattern? They're all over the place. Quilts Galore has a lot of variations of Crosses.